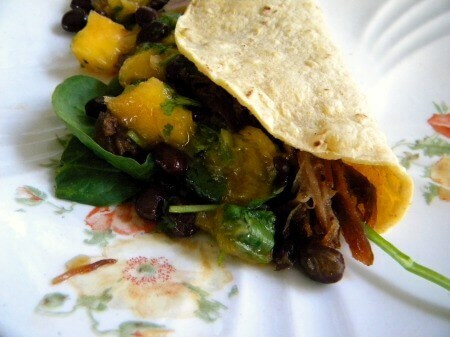 Shredded pork tacos with mango salsa are one of my favorite summertime meals. You can use leftover, grilled pork or slow cook a pork roast in your crockpot. Once you have that done then the rest goes together very quickly so it’s great for a busy weeknight or dinner after a day at the pool. You might also want to make the mango salsa ahead of time — it will keep a week or so in the fridge. O.k..on to the Pork Tacos. This is a perfect meal for a weeknight. Just take a pork roast and rub it with your favorite rub. I like a Jamaican Jerk rub but you can use anything. Stick it in the slow cooker with maybe a half cup of beer. Cook it on low for eight hours. When it’s all tender and delicious and your house smells so good your mouth starts watering when you hit the driveway… well that’s time to take two forks and pull them in opposite directions across the meat to shred it. That might take a few tries to perfect your technique, by the way. You can either use it then, refrigerate it for later, or freeze it for much later. It’s your call. When you’re ready to make the tacos warm the pork up slowly while the salsa is resting. 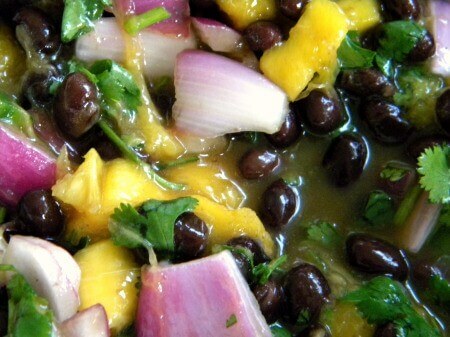 The key to this salsa is really ripe mangoes. Smell them and make sure they smell mango-y. If you want to substitute ripe peaches that will work, too. Again, make sure they are RIPE… Drippy chin ripe. I swear to you, the mango salsa is so good I could eat it as a side dish! I like to keep my ingredients chunky — I think it’s more rustic and I like the various flavors to harmonize, not blend. You can chop smaller if you prefer. 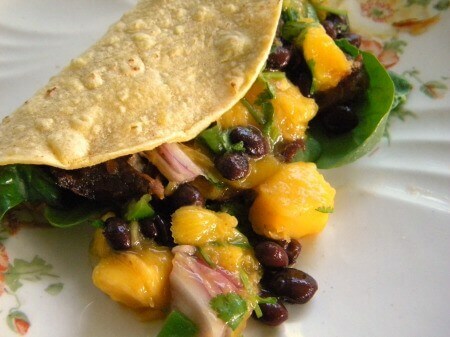 Mango and black bean salsa is a fresh addition to your favorite recipe for seasoned,shredded pork that you've cooked in the slow cooker. It's a quick, delicious, and easy to put together summer meal - great for parties! Allow flavors to blend for 30 minutes. Place a few spinach leaves on the warm tortilla. Top with 1/4 cup of the pork and then a few tablespoons of the salsa. I love mango in salsa. I really love that you added a bit of balsamic. Wonderful!